Scenic Drives in Norway | Explore Classic Routes, Soak In Local Scenery! From modern architecture to picturesque mountains, the scenic drives in Norway are some of the most beautiful and captivating in the world. Nothing quite compares to the landscapes and views that you will encounter every time you set out on a driving adventure. So, pick up your rental car, book your hotel and get ready to go exploring! There are a number of scenic routes in the northern part of the country. Of which, the most popular include the Varanger National Tourist Route, the Havøysund National Tourist Route, the Lofoten National Tourist Route, the Senja National Tourist Route and the Andøya National Tourist Route. Depending on which route you choose, you will be able to visit various interesting sights. Top attractions along the Varanger route include the Stone Age settlements at the Mortensnes Cultural Heritage Site, Nesseby Church and the local Varanger Museum. Lillefjord, Snefjord and Selvika are all great places to stop along the Havøysund route while the Senja route will take you to the Senja National Park and many other attractions. If you travel along the Andøya route in the summer, you will be able to enjoy a phenomenon known as the midnight sun where the sun does not set between 22 May and 21 July. The Viking Museum along the Lofoten route is a definite must and you should also watch for whales and other sea animals as you enjoy this drive. There are even more routes in the south to enjoy. Of which, the most popular include the Atlantic Road, the Geiranger – Trollstigen National Tourist Route, the Sognefjellet National Tourist Route, the Ryfylke National Tourist Route and the Hardanger National Tourist Route to name but a few. The Kvernes Stave Church, Bremsnes Cave and the Kvernes Rural Museum are all popular sights along the Atlantic Road apart from the spectacular view of the Atlantic Ocean itself of course. 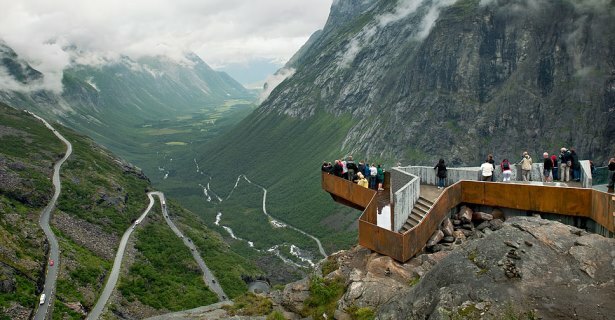 Top sights along the Geirangerfjord route include Dalsnibba and Flydalsjuvet. The Sognefjell Road is a fantastic mountain drive with sights like the Feigumfossen Waterfall, the Hurrungane mountain formation and the Smørstabbreen Glacier. Sights like a prehistoric rock-carving site, the Old Tou Mill and the Sandsfossen Waterfall are what make the Ryfylke Route so popular among locals and tourists while the Hardanger route offers drivers a chance to enjoy sights like the Hardanger Folk Museum, the Hardanger Museum Warf and five great waterfalls including the Låtefossen Waterfall. It’s clear to see that each and every route has something special to offer. If you have enough time to spare, you may want to enjoy more than one of these routes and get a real feel for your surroundings as well as the local history and culture. By planning your trip properly ahead of time, you can even book your rental car and your accommodation together online.